Population growth and urbanization processes, trends in land use, increasing impoverishment of significant segments of the population, use of inappropriate technological systems in the construction of houses and basic infrastructure, and inappropriate organization systems, amongst others, are factors that have increased the vulnerability of the population vis-a-vis the wide diversity of physical and natural events. However, lack of systematic, homogeneous, and compatible records of disaster typologies, understood as the effect of the occurrence of threatening events on the vulnerability of country, on the one hand, and insistence on considering disasters only as effects of events of huge proportions and high impact, on the other, have hidden the thousands of small and medium scale disasters that occur every year in country. Until the mid-1990's, systematic information about the occurrence of disasters of small and medium impact and disaggregated data about the effects of large scale disasters was not available in most countries in the world. From 1994, the creation of a common conceptual and methodological framework was begun in Latin America by groups of researchers, academics, and institutional actors linked to the Network of Social Studies in the Prevention of Disasters in Latin America (Red de Estudios Sociales en Prevención de Desastres en América Latina - LA RED). These groups conceptualised a system of acquisition, collection, retrieval, query and analyis of information about disasters of small, medium and greater impact, based on pre-existing official data, academic records, newspaper sources and institutional reports in nine countries in Latin America. This effort was then picked up by UNDP and UNISDR who sponsored the implementation of similar systems in the Caribbean, Asia and Africa. The developed conceptualisation, methodology and software tool is called Disaster Inventory System - DesInventar (Sistema de Inventario de Desastres). The development of DesInventar, with its conception that makes visible disasters from a local scale (town or equivalent), facilitates dialogue for risk management between actors, institutions, sectors, provincial and national governments. DesInventar is a conceptual and methodological tool for the generation of National Disaster Inventories and the construction of databases of damage, losses and in general the effects of disasters. 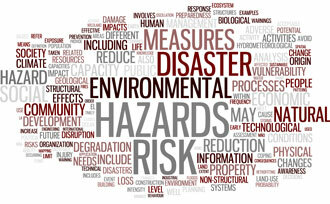 What is a Disaster Information Management System? The Disaster Information Management System is a sustainable arrangement within an institution for the systematic collection, documentation and analysis of data about losses caused by disasters associated with natural hazards. The Disaster Information Management System is a tool that helps to analyze the disaster trends and their impacts in a systematic manner. With increased understanding of the disaster trends and their impacts, better prevention, mitigation and preparedness measures can be planned to reduce the impact of disasters on the communities. The Disaster Information Management System(DesInventar methodology) includes a software product with two main components. The Administration and Data Entry module is a relational and structural database through which the database is fed by filling in predefined fields (space and temporal data, types of events and causes, sources) and by both direct and indirect effects (deaths, houses, infrastructure, economic sectors). The Analysis module allows access to the database by queries that may include relations among the diverse variables of effects, types of events, causes, sites, dates, etc. This module allows at the same time to represent those queries with tables, graphics and thematic maps. UNISDR, the UNITED NATIONS OFFICE FOR DISASTER RISK REDUCTION is the host and main sponsor of the development and world-wide dissemination of DesInventar, especially in Asia, Africa and Oceania. UNDP, the UNITED NATIONS DEVELOPMENT PROGRAMME supports, uses in many countries and has generously funded in part the effort of DesInventar-web. UNDP has also provided its continous support spreading the ideas, methodology and tools around the world. DesInventar project was initiated by LA RED, The Network of Social Studies on Disaster Prevention in Latin America. LA RED is a non-profit NGO with over 17 years of activities mainly in Latin America, the Caribbean and now Asia and Africa. Special thanks to OSSO (Corporacion Observatorio Sismológico del Sur Occidente), where the inception of the project took place. OSSO support has been crucial for over 12 years to let DesInventar Project reach its maturity. DesInventar on-line is powered by wonderful and freely available Apache Software Foundation open source products: Apache HTTP server and Apache Tomcat (JSP/Servlet container).